Why Gold Smuggling Has Increased 446% In The Last 12 Months? Indian Government is currently a worried lot as far as Gold import and smuggling is concerned. Compared to last year, gold smuggling has increased by 446%! Last year, Directorate of Revenue Intelligence (DRI) had registered 40 cases of gold smuggling, wherein Rs 44.80 crore worth of gold was trying to be smuggled into India, which is normal in Indian standards. But within last 12 months, DRI has encountered 148 cases of gold smuggling, up from 40 last year. 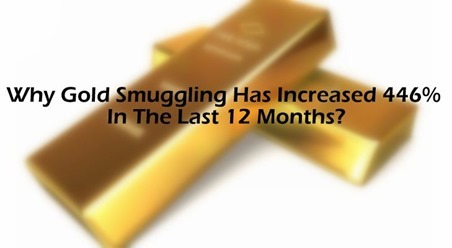 The combined value of seized smuggled gold is now at Rs 245 crore, an increase of 446% compared to last year. Compared to 202 people arrested last year, airport officials and DRI have arrested 464 people in 2013-14. At the Indira Gandhi International Airport, officials have seized 353 kg of gold in this current financial year, registering 363 cases valuing the booty at Rs 90 crore in this fiscal year. Last year, it was not even half of this. Government officials are hugely concerned as the smuggling of gold has even surpassed narcotics smuggling which is normally always in the ‘high’. Last year, officials had seized narcotics worth Rs 194 crore, thereby registering 36 cases of smuggling, which has ‘marginally’ increased to 44 cases amounting to Rs 209 crore this year. But officials are baffled with this sudden rise in gold smuggling, which used to majorly happen in the 60s and 70s to take advantage of the huge price difference in Indian and foreign markets. But now as the prices are almost at same level, why is Gold being smuggled I such high volume? Why Gold Smuggling Has Increased? Last year, to control the Current Account Deficit (CAD), Government of India had imposed restriction on it’s import, and additionally increased duties as well. CAD, which in layman terms means the difference between inflow and outflow of commodities had increased to an historical height of $88.2 billion which is about 4.7% of the country’s GDP in the year 2012-2013. This panicked the government as this high volume of CAD was mainly happening due to high imports of Gold and Petroleum. The Government of India is hoping that due to the steps taken to balance this export and import of Gold, CAD will come down to $32 billion by the end of this year. India is the largest consumer of gold in the world, and the charm and attraction this precious yellow metal has on the Indian population, especially women is not hidden. Last year, we bought 975 tonnes of gold, which was in itself a new record. What is your view on the gold smuggling trend in India?